The Sidhil Solite UK 4 Section Bed is the new improved successor of the Solite Laser 4. The Solite UK 4 Section Bed is an electrically operated profiling bed with variable height adjustment. The Sidhil Solite UK 4 Section Bed is the new improved successor of the Solite Laser 4. 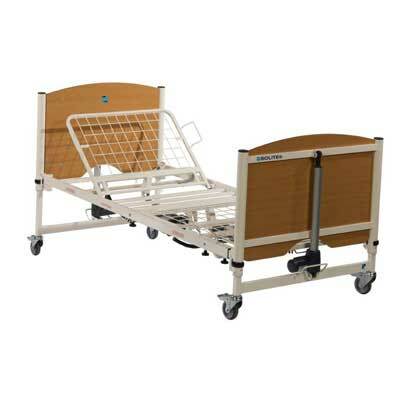 The Solite UK 4 Section Bed is an electrically operated profiling bed with variable height adjustment, designed for use in community locations such as care homes but can also be used for those receiving care at home. The profiling features of the Solite UK 4 Section Bed are electrically operated backrest, knee break and variable height plus tilt and reverse tilt positioning as required. It is operated using a single handset with lockout programming. The Solite Bed also has the advantage of simple assembly using a simplified corner locking mechanism which requires no tools. Lightweight sections make the bed easy to transport, whilst the reduced number of moving parts mean it is extremely reliable in use and easy to clean. It is acknowledged to be the highest specification product in its class and is an improvement on it's predecessor, the Solite Laser 4. The Solite UK 4 now also features auto regressing backrest to eliminate pinching in the sacral area, and an integral bed extension for improved flexibility and versatility. 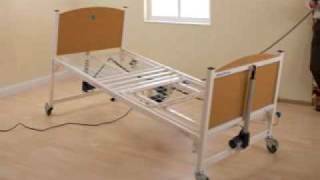 A number of mattresses and accessories are available for the Solite UK 4 Section Bed (see related products below). Electrically operated profiling bed with variable height control. Auto regressing backrest to eliminate pinching in the sacral area. Integral bed extension for improved flexibility and versatility. A single handset which can be locked to limit either all or any functions is supplied as standard. Designed to be easily assembled and disassembled using the simplified corner locking mechanism. Magnolia BioCote® paint finish - antibacterial coating. 5 year warranty (1st year - parts and labour, 2nd to 5th year parts only).